This documentary tells the story of the legendary performer and iconic social satirist, who transcended race and social barriers by delivering his honest irreverent and biting humor to America's stages and living rooms until his death at 65. Featuring a cast of comedians, historians, activists and artists, this film dives deep into the psyche of a comedic genius. I Am Richard Pryor is directed by Jesse James Miller and was released on Mar 12th, 2019. 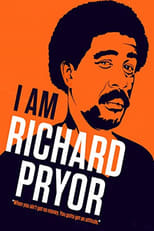 Director Jesse James Miller's Documentary movie I Am Richard Pryor is produced by Paramount & was released 2019-03-12.